Your Source of All News and Opinions Covering Car Parking. After 3 years away in the Middle East, I’m back in New Zealand and back in the Parking Business again. It was an education in the Middle East and over the next few weeks, I will detail some of the things I saw and learned while I was away. Its sufficient to say that they do things differently there! I managed Queen Alia International Airport parking while in Jordan. Unknown to most Antipodeans, this is the number 1 airport in the region. Yes, better rated than Dubai and wrangling for top spot with Abu Dhabi Airport. QAIA were number 1, knew it and wanted to keep it that way. The attention to detail and concentration on customer journeys was well known because of the stream of other airports visiting the site to see what they were doing so well. QAIA parking was good. I also spent time managing the car parking at King Khalid International Airport in Riyadh, Saudi Arabia. Not as efficient as their middle eastern cousins when it came to understanding how parking worked, how it linked into the passengers journey and how to optimise the resource. A lot of the issues were the way the management and the procurement processes worked in the Kingdom. This is a storyt for another time. I’m happy to hear from all of the readers of this blog and its good to be home. You are flying to Asia. 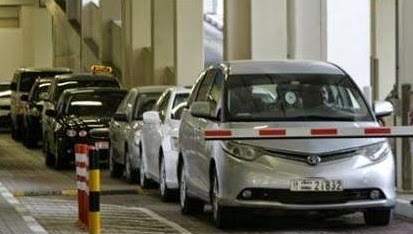 You drive, perhaps by driverless car, to Auckland Airport, parking at the new multi-storey car park connected to the terminal. You check your bags in at the car park. You read that right. Car park check-in. It's all part of a 30-year, multi-million-dollar vision - including a new runway, a railway terminal and hotels which will see more planes, more travellers, more retail shops, restaurants and bars, giving the airport the presence of a sophisticated precinct. There will be heavy emphasis on comfort, convenience and what business jargon labels "a seamless experience" for travellers, with the airport of the future uniquely Kiwi in design, architecture, food and drink and shopping. Checking in at the car park, likely to be achieved by 2022, is just part of that seamlessness as the airport prepares to meet the next wave of growth in tourism to New Zealand and of Kiwis flying overseas for business or pleasure (up by 5 per cent this year, according to official statistics). million. About 75 per cent of all trips into New Zealand come through Auckland. "We might hit 25 million trips by 2025 - potentially sooner, given we are currently looking at around 8 per cent growth for this year. Furthermore, research shows that by 2030 almost 80 per cent of the world's middle classes - including the growing middle classes in China, India and South America - will be one plane trip away from New Zealand." "That's a huge opportunity for New Zealand tourism. That's why Auckland airport has been working in with Tourism New Zealand and airlines on a travel, trade and tourism partnership which has encouraged a lot more airlines to fly here." Matthews says future possibilities can be seen by looking at Ireland: "the same sort of land mass as us, an island like us, the same sort of population but four times the number of visitors, managed well and sustainably so the product doesn't get ruined." The first phase of Auckland Airport's expansion is already under way: "It's the first of the building blocks over the next 18 months; it'll see our international emigration expanded, further streamlining customers' passage through security, with more retail shops and new seating areas. "Then we will be adding more gates so we can park the increasing number of planes flying here. That will be completed by the end of 2018; the next big project will be a new domestic terminal joined to the international terminal - scheduled for 2022." So when that traveller electronically checks in baggage at the multi-storey car park, he is beginning a process designed not just to smooth his way but to provide a sense of comfort and entertainment - making the airport far more a part of a holiday, for example, than it has been in the past. "Streamlining is hugely important, of course, to cater for expected growth and enhance the travelling experience," says Richard Barker, the airport's general manager retail & commercial. "It's also a question of developing amenities like retail shops, restaurants and bars, so we capture the best of New Zealand and the best of the world in a Kiwi airport environment - unlike some airports round the world, where you could be anywhere." New Zealand is not the only country gearing up for tourism growth. Global tourism is expected to increase by almost 4 per cent this year while retail shopping at airports is also a growing phenomenon. Research by UK retail consultancy Verdict suggests the global airport retail market will near US$60 billion by 2019 - nearly 73 per cent higher than actual receipts in 2013. They say the increase will be stimulated by growing numbers of passengers and increasing prosperity in emerging markets pushing up traveller spend. European airports like Vienna, Frankfurt, London's Stansted and many others are boosting food & beverage and shopping areas; Stansted has completed a $175m upgrade to increase space in the departure lounge and provide more shops to feed demand. Barker says the airport is working hard, even as Phase 1 building is under way, to boost satisfaction levels and has already enhanced the retail presence airside: "We are already the biggest shopping mall in New Zealand on a sales per metre basis - more than Sylvia Park, although they beat us on actual volume. "We are introducing building up a selection that outstrips what is available in 'high street' Auckland - like our Victoria's Secret outlet, New Zealand handbag label Saben, fashion label Ruby plus outlets like Benefit, Keihls, Urban Decay, Jo Malone and more." After attending a recent New Zealand Parking Conference this (southern) spring, I was heartened to see that some Councils are working diligently toward a new future well with a much deeper knowledge of how parking contributes to the vitality of a city or town. They are taking on board the fast intrusion of new the technologies with the enthusiasm of a kid with that latest fishing rod - they know its god but are not quite sure how to get the best out of it. The strides new technology is making to parking around the world are immense and permanent. It is not the same business it was 10 or even 5 years ago. Some Councils are progressing faster than others, and their cities and towns are benefiting from the support to their economic vitality a modern parking system can provide. But we don’t know who these Councils are as there has been no way to measure how all Councils are doing against each other and against the major players in the market. We can’t tell how or if a city's and town's parking resources are benchmarked against the rest and how they are actually being managed. But we can now….sort of. Benchmarking is not a dirty word, for obvious improvement and quality reasons. Also since the national environment is now ranking everything such as schools and District Health Board services, it seems like a natural progression that we should rank our Council parking systems. As Councils collectively around the country manage a staggeringly large number of car parks for their communities and take in a large amount of parking revenue, there is a very real opportunity to manage this resource in a manner that provides positive returns to the businesses, the community and the ratepayers by simply doing things better and learning off those who do it better. So why not rank them! Those in the best space to understand what Councils are doing in the field of technology and modern parking methodologies are the service providers. They will visit each Council and talk to them at events like conferences, where they can form an opinion on how disposed each Council seems to improving what they are providing. So we surveyed them. The results of the survey, conducting shortly after the New Zealand Parking Association conference has been positive in that most respondents wanted the outcomes to be aimed at improvement. I need to say that very few of the comments were negative, which is a great place for the industry to start. Also please note that these companies did NOT want to do this openly for obvious reasons. The questions had not been split between the parking operations and the parking enforcement wings of Councils as some of the smaller Councils don’t split the two specialties anyway. All of these questions were asked from the perspective of someone who views most Councils and in some cases can review New Zealand’s Councils against world standards. The results show some interesting features, namely that when the results are marked out of a possible 4, the industry average is 2.4 which means that most of the City Council portion of the parking industry is above or close to average. We’re not sure if this is a good result or not but as time goes on, we can view the trends to see if our Councils are improving their service offer. I suspect that if I was facing ratepayers and businesses that I would want my parking operation to be supporting economic vitality and community access with much more than an average result! A handful of Councils have achieved above a 75% result in the opinion of the respondents. It’s probably not a coincidence that these organisations have a very proactive and positive approach to what parking may deliver to their city, Auckland Transport recently completing its Draft Unitary Plan, Christchurch City recently completed its new Central City Parking Plan and Rotorua experimenting with solutions around its retail parking. Honourable mentions go to Invercargill City Council who respondents say asked some good questions of the survey contributors at conference and New Plymouth City Council who are also spending time on trying to get their solutions right for the community. 1. What best describes the biggest issue you have with Councils parking teams? · Operations oriented (as in council centric) rather than customer oriented. · The linking of vehicle sensing technologies with customer parking payment solutions. The 2 do not need to be linked. · Budget. The old adage "you get what you pay for" very much applies here. Also, an inability or unwillingness to hold suppliers accountable for poor product/service supplied. · Lack of understanding when it comes to technology. · Difficult to access a decision maker, and council officers pretend they are decision makers. · They do not understand how technology can manage utilisation. Only pay lip service to this. · Tender process too long. · Lack of general computer knowledge. 2. What is the biggest change you would like Councils to make to improve their parking value offer to their city or town? · Raise the price of parking and use time variable price parking so that there is always some proportion (say15%) available parking. · A more aggressive approach to encouraging the uptake of Smartphone solutions for payment of parking by customers. · Directed enforcement will provide the opportunity to achieve optimal compliance/turnover. Increase the infringement fees too - they simply are not a deterrence. · Use the data from technology to improve the customer experience, determined planning. · Think like business people instead of just bums on seats. · Make on-street parking more affordable with shorter time limits then utilise major car parks for longer term use. On-street short stay, off-street long stay. · Focus on utilisation not revenue. Abolish the tender system and let cities chose providers as the private sector would. · Improve their procurement practices to stop wasting money. · More openness to new technologies. Parking is always an emotional topic when it actually doesn’t need to be. It is generally simple economics, supply v demand. As an industry it has had a ‘state-control like’ price structure for decades, which is why many people do not respect the industry – they don’t see the value in it like it was a market priced litre of fuel. It is also touched on the periphery by many and varied people, occupations and activities that don’t understand how scientific it has actually now become. It is clear that the Council parking industry in New Zealand needs to improve, as measured by the respondents to this survey, but the average is not bad. We suspect that the ratepayers and communities of New Zealand would also see improvement as a necessary step for vote ratepayer funds. We hope the Councils take this information as a positive opportunity. Parking is not going to get any less important over the next 30 years and with some Councils looking to maintain their current vehicle loads and to mode change the growth from now and into the future from petrol to electric. It is clear we need to better understand how to control and manage that contribution that Council parking makes to each city. Watching the mighty All Blacks beat the USA rugby team at Chicago in November made me think about how this team has become one of the most successful sports teams the world has ever seen. The ‘All Blacks’ (reference to the colour of their uniform) are the national rugby team of New Zealand, and even taking into account the fact that there are only 4.5 million people in New Zealand, their achievements on the world stage and against much larger countries, have been mind-bogglingly successful. To give you some idea of their stature, over the 144 years rugby has been played in New Zealand and the 130 years the All Blacks have been playing other countries, they have only ever been beaten by 5 countries, won 400 of their 524 games played at a win rate of 76%. As of September 2014 this year, they are on a streak that includes 20 games in a row unbeaten and 36 games unbeaten at home, all against tier one international teams and in some hostile environments from Johannesburg to Buenos Aeries and now London to Chicago. They became the first rugby nation in the professional era to achieve a 100% winning record in a calendar year. How do you create a winning team like the All Blacks? How does an organisation go out to fashion a record almost unmatched around the world for any local or international sporting team, over such a long period? I have tried to put down on paper a few of the immediately obvious traits that the All Black organisation clearly used to their benefit and these traits can be transposed over to a commercial parking organisation. The definition of talent is a natural aptitude or skill. I don’t believe this. I believe talent comes from hard work and years of preparation. You may have heard of the 10,000 hours (Malcolm Gladwell) it comes to becoming an expert. Take Tiger Woods, he achieved expert status probably by the time he was 5-7 years old, and today that would be Lydia Ko. Access to or attracting the best talent is a major challenge for any organisation, but for one that has its eyes on being world class, it needs the best talent on board, with the best talent coming through in a wave right behind, pushing standards higher and higher. To test this I went through a number of parking job vacancies online to check out what the vital and typical skill or talent was that if in abundance in your organisation, would transform you into a world class parking outfit. There are no single set of skills that makes a parking person like accounting makes an accountant or law makes a lawyer. Organisations have advertised for public administration, business administration, engineering, Bachelor Science, Bachelor Arts, or ANY 4 year degree. To cloud the water even more, for my team here, I look for economics skills – the balance of supply & demand must be understood as a priority. You can sub-contract the other skills. Maybe identifying talent young, with basic skill sets and investing in them until they become world class is a way to improve your business. I don’t know of any parking company that does that. The structure must be set to be focussed on ONE goal, success. The All Blacks are blessed with a structure in New Zealand where every town has a rugby club. When New Zealand was being developed in the 19th and early 20th centuries, the rugby club was the place where all of the farmers and town folk would meet up. It was like the town hall and so the game spread around the country. Today you could not replicate that infrastructure simply. Most sports organisations short circuit that process by having commercial relationships with other clubs around the world. Parking companies should look at something similar to extend their influence and to access resources limited in their own environment. The New Zealand Rugby Union controls ALL rugby in the country. Every town has a team, every suburb or region has a representative team, every region flows into a provincial team and 26 provinces in New Zealand form the five Super Rugby franchises that compete with teams other countries that go from South Africa, Asia, Australia, New Zealand to Argentina … the long way around! Each of these franchises from New Zealand form the All Blacks. With that pyramid structure, it’s easy to see how THE single goal of a small country is a winning national rugby team. Many companies including parking companies do not know what their single goal is and in not knowing that goal, they can’t organise themselves to achieve it in a world class fashion. The All Blacks organise themselves to win international rugby matches better than anyone else in the world, what does your parking company do? The management structure of the New Zealand Rugby Union gives the right to organise and run the rugby programme of the All Blacks to the All Blacks management. They understand that the coach and players are the experts and will get it right. Rugby Union focus is on supporting the team through good times and bad. They trust completely that the team is doing the right things to achieve its goals. How may cities, councils and perhaps companies trust their teams to get the job done? An example of this is when the Councillors, Mayor or even the CEO give direction of operational matters like pricing. Operational matters belong to operations and in this case the All Black team. You wouldn’t hear of the Union instructing the All Blacks on tactics. With a positive and achieving culture, supported by a trusting management structure, you can develop a team that pulls together during bad times and still manages to win, even in the last minute of the game. However, to consistently beat the world, you must get there first. This means that developing new technologies or new methodologies to operate your car park should be trialled and tested, even if no one else in the world has ever done it before. Not rushed, just impatient. Developing a healthy impatience or a positive edginess should be encouraged. The All Blacks score more points than any opposition, even when they go a player down with a yellow card. Even when they are 14 on 15 players, their record shows they rise and score more points. This is a staggering achievement based on a desire to be the best in the world. The All Blacks have shown the world that to be world class you have to get a bunch of things right, all at the same time. They don’t wait for others to achieve, they don’t wait for others to learn how the All Blacks do it and catch up, they keep challenging, testing, trialling, watching, adapting, recruiting, trusting, desiring and building. Aren’t these traits we want in our business and the industry? What will you ponder over Christmas??? I note no one has yet tackled the issue of what happens when you send your driverless car to a car park (or home depending on the value of fuel vs. parking costs), after being dropped off, and its full? Do you send it to a car park in the same parking company’s livery or will competing parking companies have to speak to each other to communicate vacancies? Will the commercial parking companies have to allow vacancy data out for Google, Audi or BMW to use? Will pay by Phone companies finally set up a single common ‘wallet’ like Paypal etc so uses don’t have to have 5 Apps on their phone and uptake can be sped up? Gary McCormack Furious About Parking. The problem is, the car park he is showing in the video is one of the better ones in Christchurch. In Nelson, at the top of New Zealand's South Island or Te Waipounamu (Maori name), there is a hive of activity around trying to solve a main street retail parking problem. Regularly the sunniest place in New Zealand, the issue is creating chills with some of the abuse hurled at the poor old Enforcement Officers, so much so that nelson may be showing it up as an unfriendly place. Why? Because they cant solve their retail parking problems. Retail parking is a very simple issue to solve. It’s straight up economics, not emotion, not traffic engineering, not planning, just economics. It’s the balance of supply and demand. Whether by time restriction or metered charging, its still just about economics. This fact eludes most people. I’m not sure the Council and the retailers have actually defined the issues here, so that would be a great place to start, so I will have a go here. 1. Provide enough parking for shopping customers to come and stay as long as they are shopping, and no longer. 2. Provide some parking for the staff of those shops and commercial premises to park all day. 3. Its not really a number three but I thought I would throw this in - Council will get its revenues anyway, either by parking meter or by enforcement (due to the extra traffic generated by free parking)….its never free. Firstly, you have to understand how to manage the parking resource in the city. It is limited. There are only so many car parks to go around. Generally, more people want them than there are car parks. This makes it a scarcity so you must actively manage it. But to what levels should you manage it? In modern parking methodologies, the ‘occupancy rate’ is the Number 1 KPI in parking now. You must set up your system to ensure full utilisation of parking, that is a working occupancy rate of around 60% to 85%. Any higher, then the price should go up to control it (occupancies higher than 85% start to show signs of congestion). Any lower then the price should go down to improve utilisation. There is a large amount of work now showing that people looking for car parks are up to 45% of the actual traffic in a busy city. The answer to that is to get the pricing or time restriction signals right and then communicate that in depth so that the parking decision is made before you leave home or work. Price is a tool but not the main goal ….. occupancy is the main goal of retail parking although retailers will try to jam you into their car parks anyway because parking relates directly to footfall and they generally don’t care about you until you get into the mall (see most malls in the country). These days we have a lot of modern tools & technologies in the tool box to set up a modern parking system, pay and display machines, pay by phone, barrier gates, licence plate readers, parking sensors, signs, paint on the road, education and finally, parking enforcement officers. You can use some or all of these together. Taupo uses an enforcement only model, which is say P60-P120 with sensors on the street to keep the cars turned over. Most big cities will use parking meters and pricing to turn cars over. As you can see, the rates climb significantly at the time you want to turn the car park over. It also has the affect of being positive in nature versus the inherently negative enforcement and infringement approach; in fact it is proving around the world to reduce the need for enforcement significantly. For staff and office workers, they can park in areas away from the parking for shoppers because, for a major proportion of them, if you can’t park shoppers, they wouldn’t have a job. In this case you make it cheaper or with longer time limits where you want them to park to incentivise them away from the main shopping areas.. You can always improve public transport to incentivise them on to the bus (see my article on TDM here). See, parking is easy to fix, you just need an economic bent. Parking is about economics, not only traffic engineering or planning and certainly not just enforcement. I suggest taking the more positive approach and organise the balance of supply and demand and cut the poor old Enforcement Officers some slack…. It’s the system, not them. How do you deal with too much parking? And here comes the Parking Revolution! Mall Parking - people in circulating cars are not shoppers, they’re people circulating in cars! Parking Space on a Par with the Skills of the Surgeon....SERIOUSLY! Company who brought us Meter - Eye now targets the disabled bay abusers. This Blog is a personal opinion and should in no way be regarded as an opinion held by an employer.. Picture Window theme. Powered by Blogger.